Most people hated the Werehog in Sonic Unleashed, but at least we didn't get the blinged-out gangstahog. Yeah, okay, I get it. Nobody liked the Werehog in Sonic Unleashed. I'm not saying I did. I didn't play the game, though I'll say that I have more of a stomach for franchise butchering and tacked-on God of War rip-off gameplay than most folks and besides have little sentimental attachment to Sega's allegedly once-great blue blur. All I'm saying is: it could have been a lot worse. 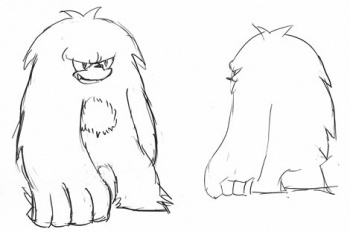 Sega just posted a few pieces of concept art for Sonic Unleashed, which reveals some of the designs for the Werehog that didn't make the cut for the final game. They're all, well, way worse than what we saw in the actual game. There's the Werehog with tiger stripes on its forearms to make it look, uh, fierce, I guess. Then there's the Werehog with some sort of flame patterns all over it that are supposed to be badass probably. Finally, we've got the vaguely hip-hop Werehog who has chains wrapped all around his limbs and a gigantic lock on his chest (uh, alright...) and, worst of all, the Yeti Werehog. Yep, the thing is covered in thick fur and doesn't even look that intimidating. It's just standing there, it looks sluggish and doesn't really inspire feelings of anything but bewilderment and confusion. In other words, it's not Sonic.